Since the classic work of G..r.a.n.,g..e.Li..1.98.8)., numerous studies have elucidated mechanisms which produce microvascular barrier damage following ischemia-reperfusion. Oxygen radicals are the major mediators of this damage. 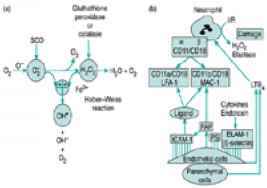 Radicals such as O2- and H2O2 are released in response to both xanthine oxidase and leukocyte activation in postischemic tissues. In the presence of Fe3+, O2- and H2O2 react to produce the hydroxyl radical (OH) which, in turn, can directly produce endothelial membrane damage (Fig 1(a)). In addition, oxygen radicals can stimulate release of inflammatory mediators such as platelet activating factor and/or cyclo-oxygenase and lipoxygenase products. 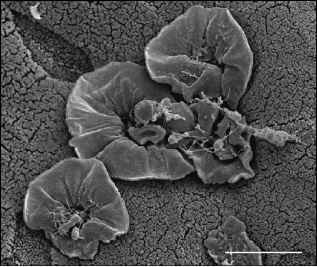 These compounds can promote leukocyte adhesion to the microvascular endothelium and directly activate endothelial cell receptors causing disruption of the endothelial barrier ( Moore eLal 1996a). Fig. 1 (a) Mechanism of production of the hydroxyl radical (OH) from the superoxide anion (O2-) and hydrogen peroxide (H2O2) in the presence of Fe3+ (O2, molecular oxygen; SOD, superoxide dismutase). (b) Schematic representation of neutrophil-endothelial interactions during ischemia-reperfusion (I/R) (PS, P-selectin).